Sony's PlayStation 3 European launch activities kicked off in Berlin last night. A midnight sale from the giant SonyCenter at the city's Potsdamer Platz was mirrored by an event under the Eiffel Tower in Paris. Berlin even played host to a concert under the stars to celebrate. However, it was the Paris event that was most interesting, from a mischievous point of view. In addition to the Xbox 360-related chair stunt in London, Parisian queues under Le Tour Eiffel were treated to a sail-past. 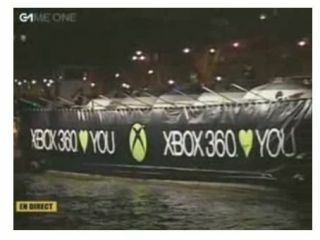 An Xbox 360-branded boat sailed down the Seine, sails billowing in the wind and the message: "Xbox 360 heart you". Class. The French event was somewhat of a damp squib, largely due to the low rate of interest. Only 60 per cent of the 100,000 French units have been reserved. Check out Jeux-France.com for excellent images of the festivities. Some punters also turned up to a midnight store opening in Amsterdam's Schiphol airport. En route to catch a plane perhaps? Reuters interviewed a PS3-buyer there, 24 year-old Nomey, who said the Blu-ray drive was more than reason enough to buy the console. "I'm not a fanatic gamer. But if I would have to buy a standalone Blu-ray player it cost me 1,000 euros," he said. Sony will be hoping for similarly passionate punters to snap up the remainder of the million consoles it has shipped to the PAL region. A total of 220,000 of these have made it to the UK.